Whatever you know of Hemingway’s writing, though, is limited by the fact that you’re only human: you can only read so fast; you can only keep track of so many words at a time. Your experience with Hemingway is qualitative, as is your experience with anything you read in a traditional, linear way. What if, however, you supplement your reading with some computational heft? Instead of treating words as a linear progression, what if you think of them as atoms you can re-arrange and re-examine under different lenses looking for interesting patterns? 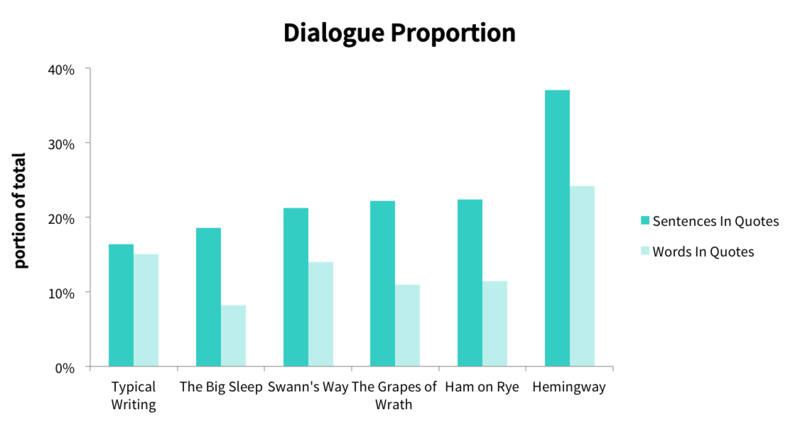 Can you start to quantify Hemingway’s style and influence? Our goal here is to do just that. 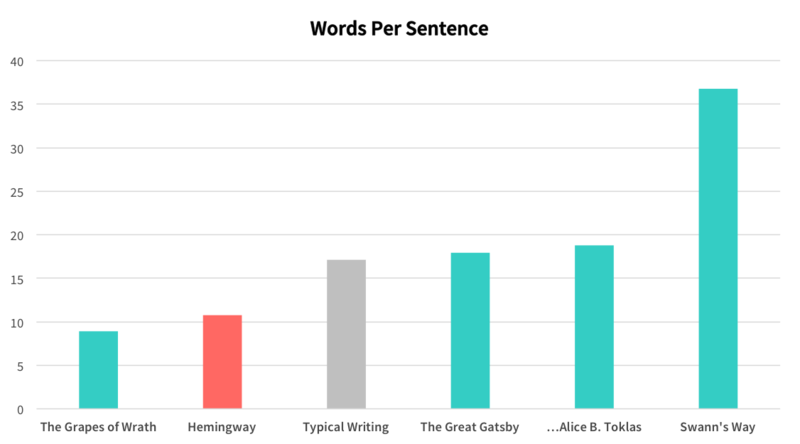 We’ll take Hemingway’s prose and treat it as data. We’ll tally his words, calculate his choices, and try to come up with a statistical understanding of what makes Hemingway Hemingway. 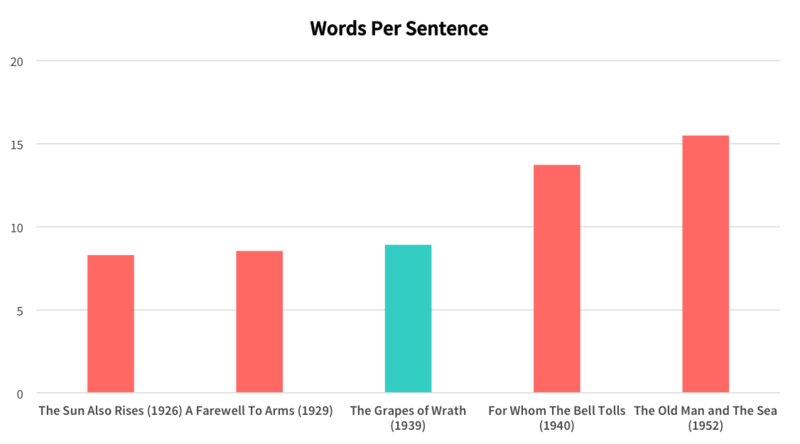 Hemingway’s sentences clock in about 7 words shorter than average, so yes: his sentences are short. Proust’s sentences, meanwhile, are really, really long. In his early novels, Hemingway out-shorts Steinbeck. As Hemingway gets older, however, his sentences get longer. So while short sentences are characteristic of Hemingway, they define his work less and less as his career progresses. After the 1-word bump, things cluster pretty tightly for 2- through 6-letter words. 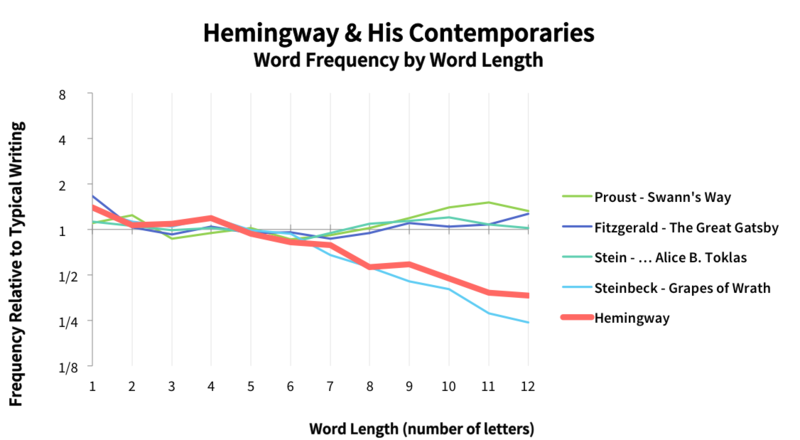 At 7-letter words, however, frequencies in Hemingway and Steinbeck plummet, while frequencies in Proust, Fitzgerald, and Stein ascend. 7-letter-and-up words: those must be the “ten-dollar words” Hemingway mentioned. He eschews them. Steinbeck, you will notice, eschews them even more. There’s Steinbeck again, more Hemingway than Hemingway. It’s worth noting that while he and Hemingway were contemporaries, Hemingway started publishing ten years earlier. Steinbeck read Hemingway, and in the manuscript of East of Eden acknowledged that Hemingway “was imitated almost slavishly by every young writer, including me.” Are these Steinbeck numbers evidence of Hemingway’s influence? In addition to thinking about the length of Hemingway’s words, we can also think about how many different words he uses. Does he use the same words over and over, or does he utilize synonyms to avoid repetition? As you can see, there’s a strong correlation between total words and unique words. That makes sense: a 5-word sentence is going to have fewer unique words than a 1,000-page book. 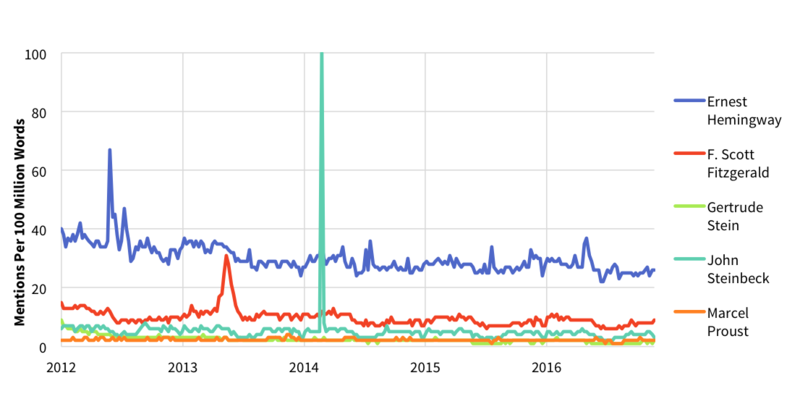 What we’re interested in isn’t actually raw vocabulary size: it’s the portion of unique words in a given passage, which is a measure called lexical richness. 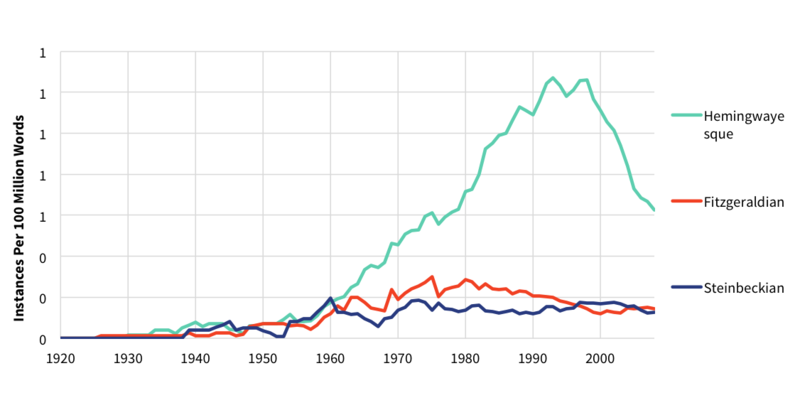 Higher lexical richness means less repetition. (This sentence, for instance, has a lexical richness of 1.00 because no word is repeated.) Lower lexical richness means more repetition. 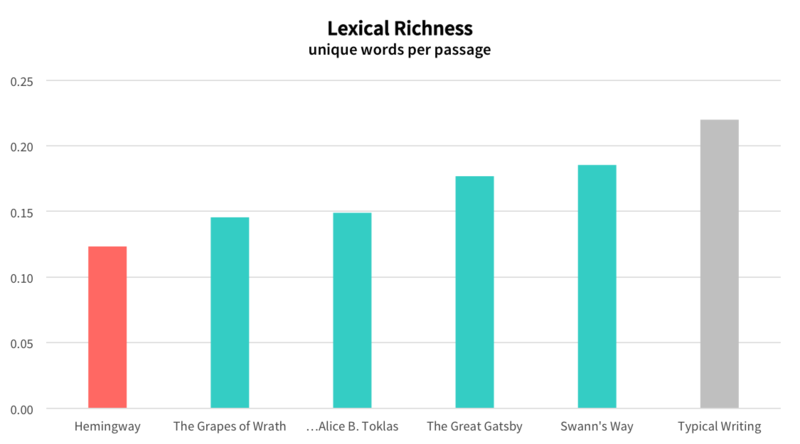 How does Hemingway’s lexical richness compare? It’s low. His word choice is repetitive. He not only uses shorter words and shorter sentences, he also chooses to use the same words over and over. 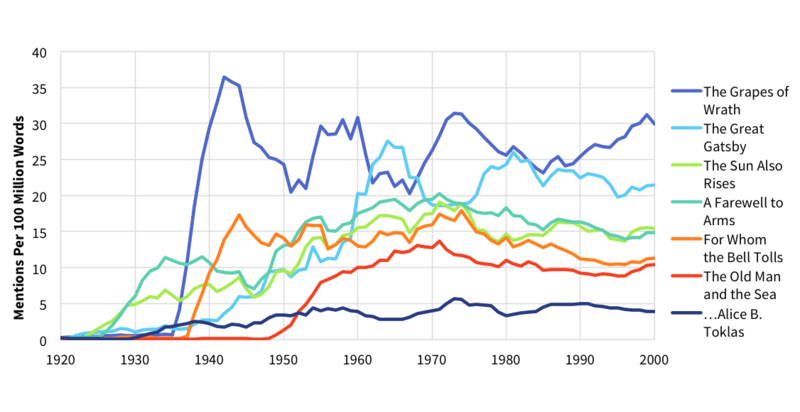 You may notice that our average, or “Typical Writing”, is a corpus of 500 texts by 500 different authors—has a higher lexical richness than any individual author. Why is that? While every author uses a limited set of unique words, each author’s set is slightly different. A given set is like a fingerprint: not only does it include its own characters, dialect, and special vocabulary, but it reflects a pattern of choices characteristic of the author. When we look at an individual author, we’re looking at one fingerprint. When we look at our average, we’re looking at 500 fingerprints overlapping. This argument is part of what led the editors of The New Oxford Shakespeare to list Christopher Marlowe as co-author of three Shakespeare plays, and we’ll return to it when we look at characteristic words. Not only does he use twice as much dialogue as an average writer, but he uses far more than any of the Hemingwayesque writers we’ve considered. Including Steinbeck. So while short sentences and short words define Hemingway’s style, what really sets him apart from his admirers is his decision to let his characters speak. The characters in The Sun Also Rises and A Farewell to Arms talk about the same amount and say about the same amount. By the time we get to For Whom the Bell Tolls, the characters talk more but say less. Finally, in The Old Man and the Sea, the characters barely talk at all. Now that we have a sense of what defines Hemingway’s style—short sentences, short words, lots of dialogue, lots of repetition—let’s see if we can hone in on the words themselves. Is there a vocabulary characteristic of Hemingway? What patterns can we find in his choice of words? 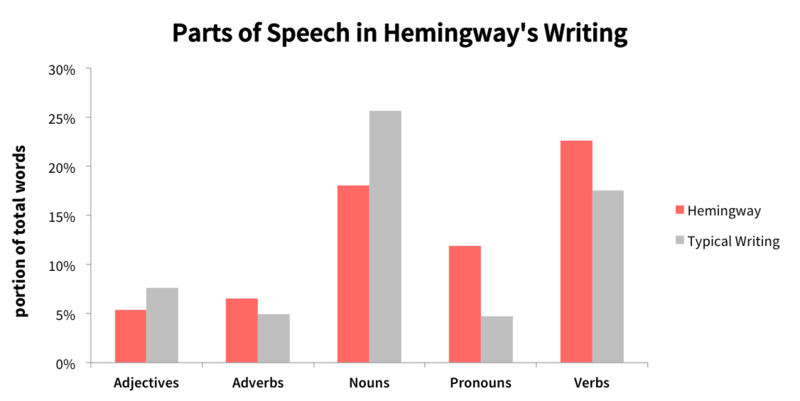 The biggest difference is that Hemingway uses fewer nouns and more pronouns than average. What does this choice suggest? Think about the number of characters in Hemingway’s books, and the amount of ink given to each one. When it comes to subjects, does he favor breadth or depth? How does his use of pronouns factor into that choice? Next, note that Hemingway uses fewer adjectives and more verbs than average. Those numbers make sense given what we observed earlier: adjectives complicate sentences and make them longer; verbs make things happen, and every sentence needs one. Fewer adjectives means less description. More verbs mean more action. The parts of speech we’ve looked at so far are the perfect ingredients for short sentences and simple words. But what about the adverbs? Based on the chart above, it looks like Hemingway uses more than average. Wouldn’t that suggest more complicated sentences? What’s going on there? Adverbs modify other words by specifying time, place, frequency, or manner. The list above includes time adverbs (“then”, “now”), place adverbs (“up”, “out”), and frequency adverbs (“again”, “never”), but it doesn’t include any manner adverbs. Manner adverbs tend to end in “ly,” and when we think of adverbs, manner adverbs are usually, reasonably, or perhaps presumptively what come to mind. 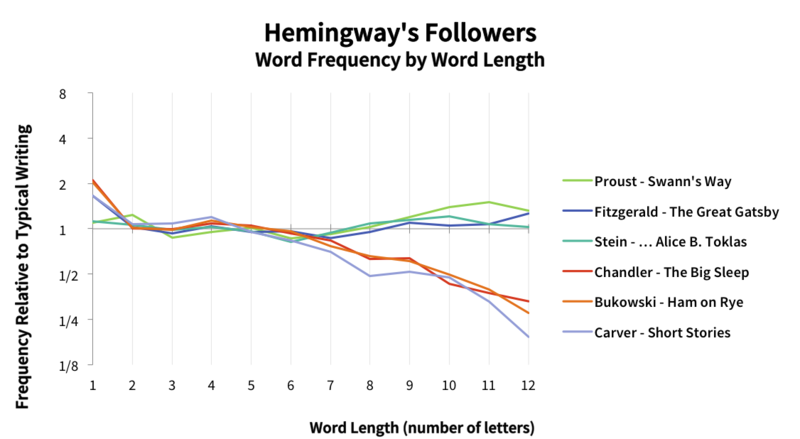 When we count up words that end in “ly,” we find that Hemingway actually uses manner adverbs much, much less than the average writer (42% as often). It’s an evocative list, and the words on it certainly feel Hemingwayesque. What else does it tell us? While there’s too much to go into here, we’ll make a few observations and think about the questions they raise. Hemingway’s verbs (“punched”, “stroked,” “galloped” and so on) are visceral and active. What does that suggest about his characters’s tendency to reflect vs. their tendency to act? 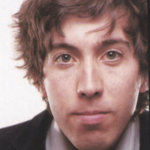 About masculinity in his writing? Most of Hemingway’s adjectives are pessimistic (“rotten,” “disgraceful,” “unfaithful,” “jealous,” “gloomy”, “repugnant”). What does that say about his characters’ worldview? About the notion of “the lost generation”? Hemingway’s nouns focus on drinking, war, bullfighting, and travel. How do those subjects define his characters’s day-to-day lives? How do they relate to each other? Most of Hemingway’s adverbs make action more specific (“steeply,” “delicately,” “mockingly”), while most of the adverbs he avoids hedge certainty (“generally,” “apparently,” “approximately”). How does the choice to avoid “hedging” adverbs relate to Hemingway’s stated goal: to make things “truer than true”? Both The Grapes of Wrath and The Great Gatsby chart higher than any and all of Hemingway’s novels. There’s a case that those are more enduring than anything Hemingway wrote. 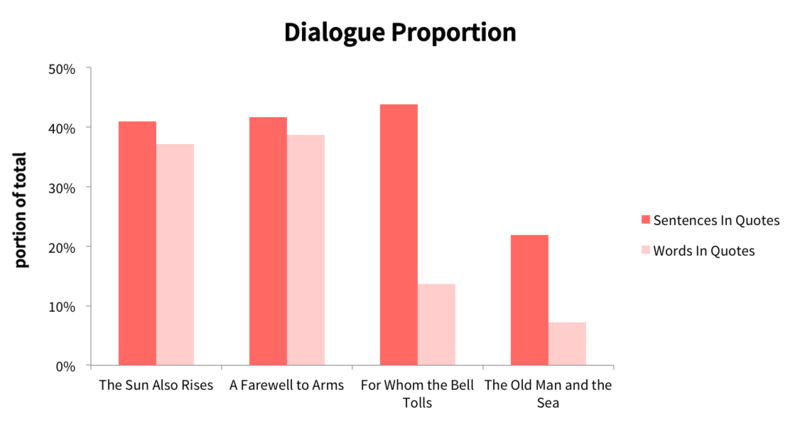 Does the higher popularity of “Ernest Hemingway” and the lower popularity of “The Old Man and the Sea” mean people are more interested in Hemingway the man and less interested in Hemingway the writer? Or are we looking at a tendency to do exactly what we’ve done, which is to write about Hemingway’s work in aggregate, but about Fitzgerald’s and Steinbeck’s individually? Can you think of ways we might try to answer those questions? How does the popularity of “Hemingwayesque” factor into our assessment of Hemingway’s relative influence? 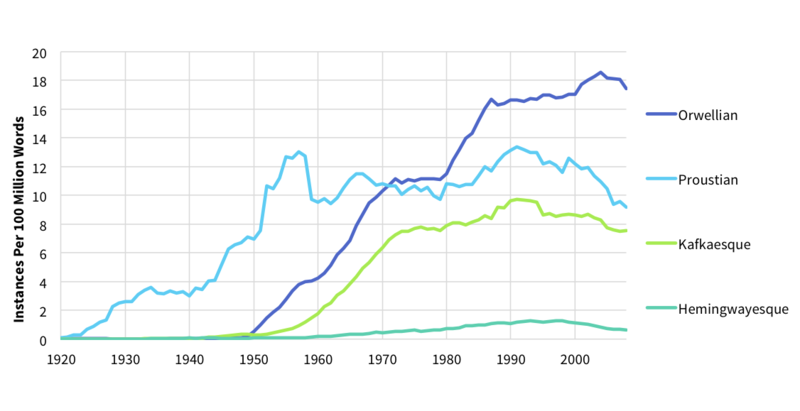 What about the fact that its popularity has been in steep decline since the mid-1990s? Is Hemingway’s influence on the wane? How, then, do we assess Hemingway’s influence? Is there some calculation we can come up with based on the relative popularity of the man, his books, and his eponym? Maybe we just to go back to the beginning, seek external validation, and note that Hemingway won the Nobel Prize in Literature. Then again: so did Steinbeck. Author Justin RicePosted on January 3, 2018 January 23, 2018 43 Comments on What Makes Hemingway Hemingway?